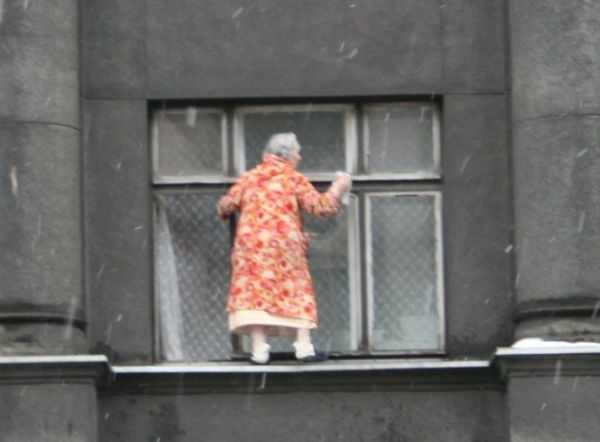 Many of my clients ask me how to touch up their windows. After all, I usually only clean their windows 1-4 times per year, and windows do get smudges and dirty patches between cleanings. It makes perfect sense to be able to touch up your windows as needed. I use a window cleaning scrubbing wand and a crisp squeegee to clean client’s windows, but not everyone has the time or inclination to master the art of squeeging a window to perfection. If not used correctly, a squeegee will leave lines all over your windows! “So, what’s a quick and easy way to get good results with just simple products and no experience?” is what people, understandably, want to know. What you want is foaming, alcohol based glass cleaner such as Sprayway and a goof microfiber cloth. Spray the window with a light mist of the foaming glass cleaner and wipe dry with your clean lint-free cloth, and presto, no more dog nose prints! I always recommend using Sprayway Glass Cleaner or a homemade mixture of water and rubbing alcohol. The “blue” glass cleaner contains ammonia which may damage certain window films and additionally they usually contain some sort of surfactant which will leave a residue on the glass. This residue will create a smeared look and later attract more grime, plus you usually get the circular hazy marks which can often look worse than before you started wiping the window. p.s. Whatever you do, don’t use paper towels or newspaper to clean your windows. Newspapers were popularized as a “good” window cleaning tool during the great depression when little else was available, but nowadays they are not a good option. Plus, newspapers aren’t made the same anymore, the vegetable-based ink will bleed easily and you will end up with ink on your windows. p.p.s. Above all, if you are using a ladder be sure to practice ladder safety procedures. ← How Long Will Your Windows Stay Clean?